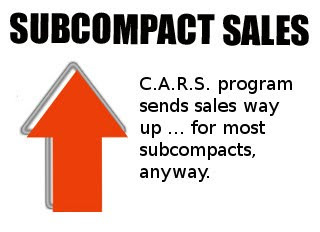 August subcompact sales: Back to reality. Well what a difference the C.A.R.S. (Cash for Clunkers) program made, well at least for most subcompacts. There were some truly remarkable sales increases from this time last year, led by the Honda Fit, which increased sales 194.1% (no, that is not a typo). But it wasn't just Honda that did well. The Fit, Chevrolet Aveo, and Nissan Versa all had gains of over 100% compared to last year. Additionally, the title for Best Selling Subcompact in the U.S. has changed hands, yet again. Pulling ahead this month is the Nissan Versa, followed by the Honda Fit, and slipping two places, the Hyundai Accent. Also of note: Kia Soul sales, which are now at 21,778. This month's loser, surprisingly, was the Toyota Yaris, which lost 47.4% from this time last year. Apparently not a favorite among Cash for Clunkers participants. To the big board! -Nissan takes the crown based on familiarity for ex-big-car drivers and supply, supply, supply. Local dealer had satellite lots filled with 'em pre-CFC, and more would only have to come from Mexico, not Japan or Korea. -I wonder if the Yaris drop was due to a supply issue, or aggressive upselling? Loaded ones aren't a great deal and the base models must've gone first. -Fits seemed to go fast around here. Toyota has the Matrix and Scions to upsell Yaris buyers to, but Honda only has sedans and coupes other than the Fit. Probably a lot of former SUV owners wanted a hatch or wagon! -Not surprising the Smart didn't do well on that basis, then. It's functionality is *that* much more limited than a conventional B-segment hatchback. Sort of a Metropolitan for the new millenium- not an all-purpose hauler, but not a sports car either. ..shipped to dealers already earlier this summer, or as CFC was going on, I meant to add! It's amazing how the Fit skyrocketed due to C4C. Back in February, one of our local dealers had 65+ Fits on the lot. I'd bet they don't have many anymore! The Fit is my favorite subcompact in the segment by far. I am glad to see that it did well! I'd actually like to add that I feel REALLY sorry for anyone who purchased an Aveo or a G3. They are miserable, awful, terrible little vehicles in my opinion. I rented an Aveo about 6 months ago since that was all they had available on the lot even though I had reserved a midsize. I hated everything about the vehicle, absolutely everything. Andy, have you had a chance to drive a G3 or an Aveo yet?